Thanks to The Library of Congress, you can now read Frederic Wertham’s actual funnybooks, complete with his notes on inserted sheets of onionskin! Article here. I wonder if Fred doodled in the margins? 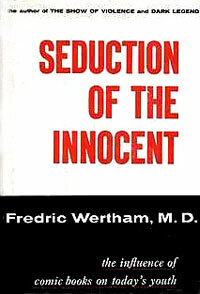 If you don’t live near the LOC, you may want to check this out instead: Go here to view The Dr. Fredric Wertham Memorial Funnybook Collection: The Comics Featured in Seduction of the Innocent. No onionskin notes, unfortunately.